Mendo Breath is an interesting cross between OGKB (OG Kush Breath) and the atypical Mendo Montage. It is an indica-dominant strain of 70% Indica / 30% Sativa. It is a very potent but rare cannabis plant which a THC level that confirms why it delivers such intense body effects. Its THC content averages between 19 – 20%. Mendo Breath buds have a lumpy round shape, and minty green nugs with furry orange hairs and a thick frosty coating of tiny bright white crystal trichomes, which makes it pretty sticky. The forces of its beautiful parent strains combine to make the dense frosty buds which exude a blend of sweet vanilla and caramel smells, and hints of cool mint. 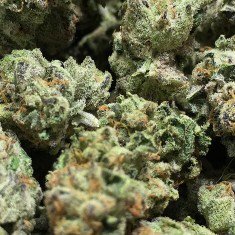 Marijuana connoisseurs will describe Mendo Breath as a “heavy-hitter”. You can evidently feel the effects of this strain after a few hits. It fills the mind and body with a delightful tingly effect which rapidly plummets into a full buzz and body high. This strain literally pulls down your physical form and elevates your mind into a state of hazy ecstasy. The sedative effects of the drug and its high level of THC makes it ideal for nighttime use, and for treating a host of physical and mental health conditions. Many medical cannabis patients would recommend this strain highly for chronic pain and insomnia. It has a sleepy and calming effect that suggests that it is keep for evening use or when your schedule is cleared out. It is an effective treatment in the management of stress disorders. Mendo Breath cannabis strain is good for people struggling with eating disorders as it significantly increases appetite. The relaxing effect of the strain also makes it ideal for treating muscle spasms and cramps. Best strain for a hard day! Very good smoke! Makes for a happy life! thanks!!!! good delivery process and best product , Thanks a lot!!! !